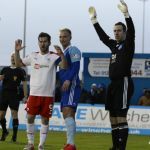 Rovers fans travelled north to Peterhead for the 3rd Round of the Scottish Cup in bright but increasingly blustery conditions. Some arrived in time to potter about the town and take some pictures of boats and aquatic birds the names of which escape me. The wind was strong and in the ground looking at each corner flag anything but consistent, flapping them one way then the other. Just before kick off there was a light shower and it was chilly for all who’d made the trip. 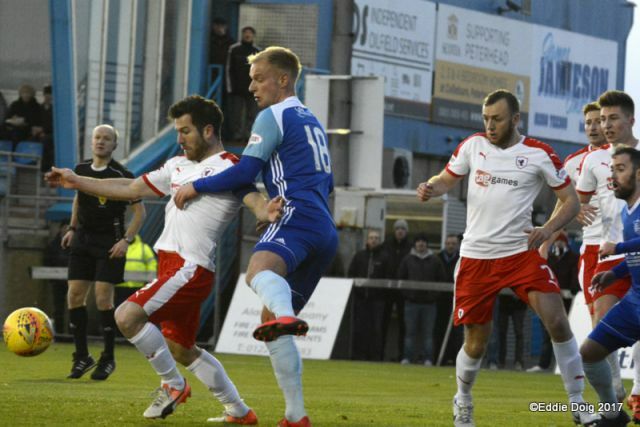 Without Lennox or Cuthbert, McHattie, Benedictus, Davidson, Barr, Vaughan, Zanatta and with empty seats on the bench the Raith line up will have provided as much encouragement as for the home side as it did concern for the visitors. 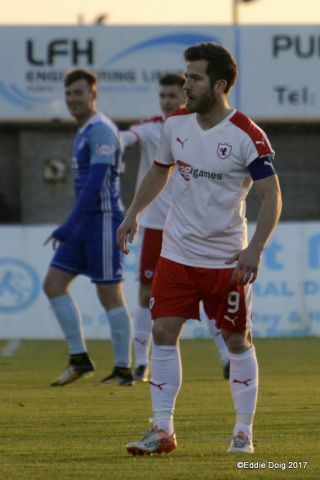 Robertson was in his more accustomed midfield role with Buchanan wearing the arm band up top. Peterhead chose to shoot with much of the wind behind them. A low ball into the box for the dangerous McAllister was got to by Smith before the home man. Smith then held a shot at him from 18 yards. At the other end Court shot low after good work from Spence. 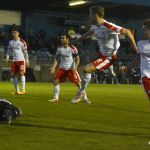 From the start there were moments which were crying out for the Benny Hill theme or similar backing music as players set themselves to win headers and the ball sailed way over them or dropped two yards in front. Whipping along and out after players thought they could get to it but clearly couldn’t or team mates leaving the ball to each other and then having to recover and try to contest it as the ball slowed or speeded up. Very little actual football was possible. 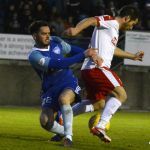 Having made the trip to Balmoor a few times over the years your intrepid reporter knows there is generally a breeze but other than having it behind them the home side didn’t really look much more prepared or able to capitalise on the conditions. 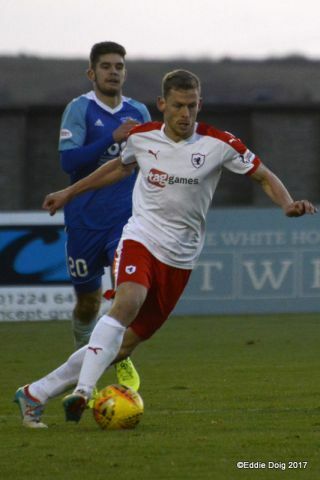 Stevenson crossed following a slack Raith pass but the resultant shot went over. 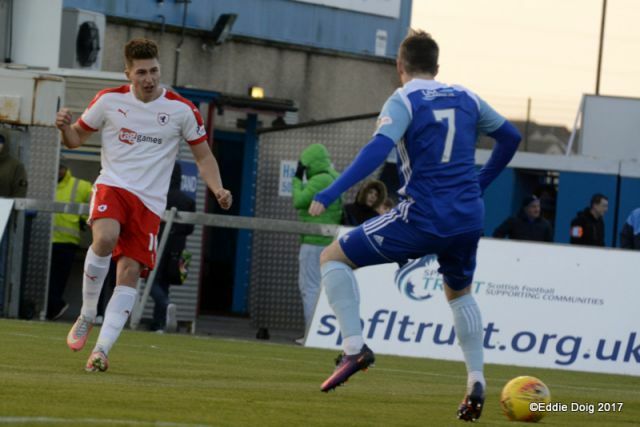 In the 17th an inswinging corner – whether intentional or not – landed just on the roof of the Raith net. 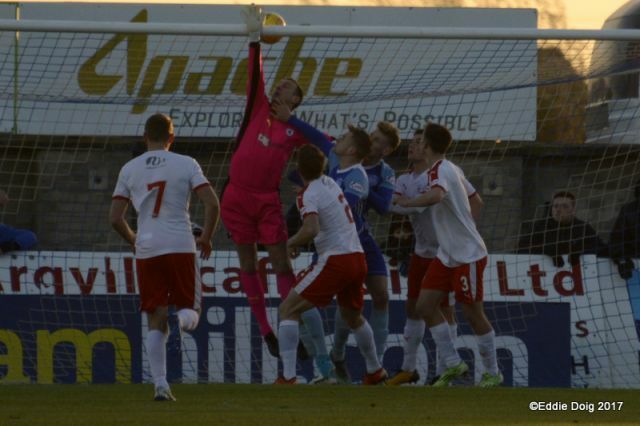 It was pretty difficult for the Rovers to get the ball away from their goal. Following another home corner a blue shirted man got away with a shove on a Rover just before a shot hit another home man but yet another corner was awarded. 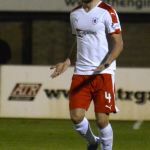 Jonny Court was booked trying to win a tackle but the ball was again affected by the conditions making the challenge look worse than it was. 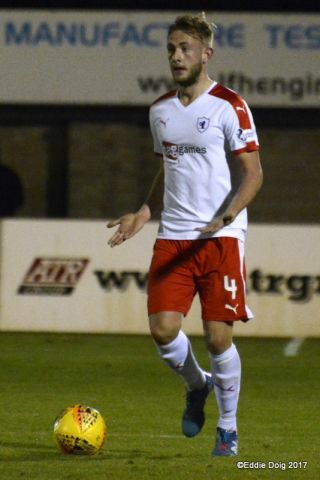 Ex Falkirk man McCracken reacted as if the youngster had murdered someone but the referee rightly didn’t take the old pro’s reaction seriously and Court was unlucky to be booked. Mason Robertson headed wide from a corner then Spence did well wide and his low centre just eluded the inrushing Court. Matthews got to a similar area wide finding Buchanan in the middle but the ball got caught up in his feet as he tried to turn and the chance was gone. 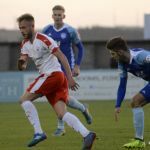 On the half hour Ferry was replaced by Jordon Brown having not recovered from being on the end of an overly vigorous attempted header from a team mate. 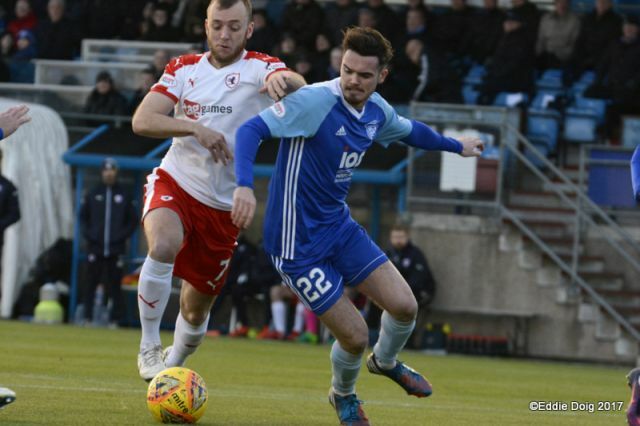 The home side were taking every opportunity to leather the ball forward whether at anyone or not aided by the wind and Murray and McKay were doing well to cope. Leitch took exception with a correct decision from the man in black and was more than fortunate that his repeated protestations despite a warning did not lead to a foolish caution. Smith punched a cross out, then McAllisters dangerous centre was well dealt with by McKay. 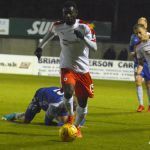 Despite ten corners to the Rovers one and the elements being on their side the hosts could not score and it was nil nil at the half. 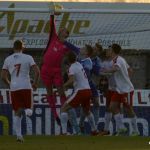 The second half began brightly, well if you count the referee and his assistants having swapped black for yellow tops – hopefully for them having been on a radiator for the first forty five minutes. The sun was setting and the wind had died down a bit as the temperature dropped. The amount of football on show was still minimal. 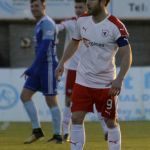 The Rovers had a flurry of chances in the first minute when Buchanan turned and Spence saw his shot blocked well by Fleming in the home goal. A shot from the rebound was blocked and the ball scrambled out for a corner. 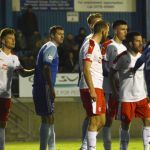 The much travelled Stevenson fouled Herron deftly but didn’t fool the Ref and words were exchanged as was some minor shoving. No cards were flashed. 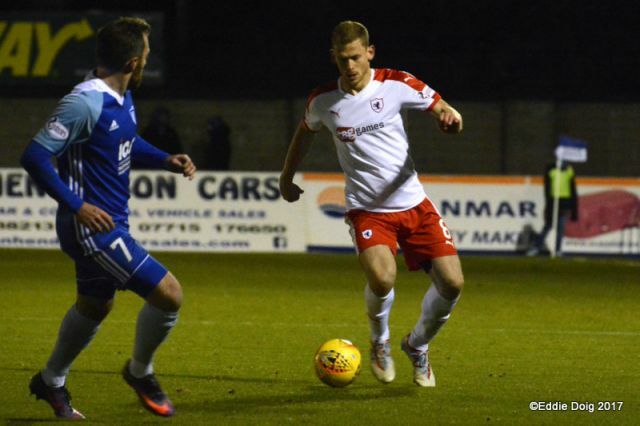 Stevenson did something better a couple of minutes later sending in a dangerous cross which Russell McLean headed well wide. McLean has incidentally more than a passing resemblance to Davie Lloyd, the Rovers front man of the late eighties. 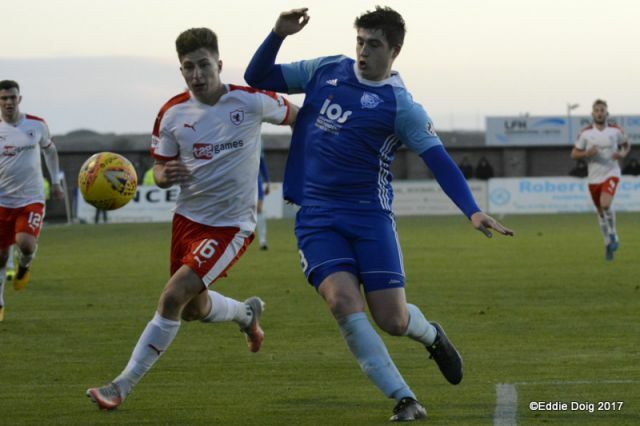 In the 54th minute Peterhead got wide and as Smith in goal stayed on his line a cross to the corner of the six yard box was headed in with ease by Jordon Brown. Looking to respond a clever Court dummy on the edge of the box saw the resulting Buchanan shot blocked. 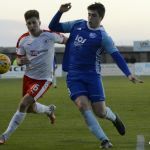 However at the other end (following what looked like a foul) Peterhead capitalised on the lack of a whistle and Rory McAllister volleyed first time past Smith from about nine yards to make it two nil. 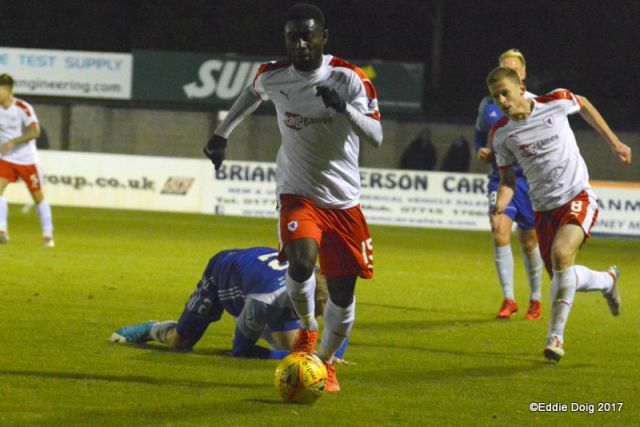 Spence was replaced by Yaw Osei and Robertson was surprisingly booked for a minimal tug on a Peterhead mans shirt. The wind had died down quite a bit by this stage not that the Rovers didn’t have other things to be concerned about. 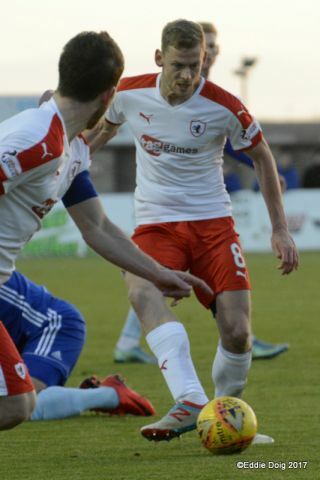 Thomson was pushing on into space but not getting much of the ball, when he did he found Buchanan in the box but again he couldn’t capitalise. 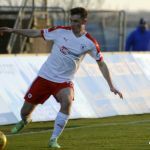 The big home front man McLean found McAllister who shot just over despite looking like he had taken a knock earlier on. 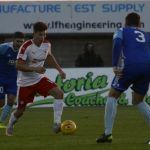 The Rovers taking only their third corner pushed on and Rory McAlister got the ball from the short corner and raced up the park. 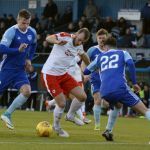 It was initially four on two then five as the striker unhindered by his earlier problems ran on into the box and despite options fired easily on the angle past Smith. The last five minutes or so were uneventful apart from sub Alan Smith’s move into the box being easily Policed by Thomson and Leitch who’d previously been lucky to avoid a yellow card being booked for time wasting. Cold and very windy at Balmoor this afternoon. Big news is Vaughan is not playing and Raith have only four subs on bench. 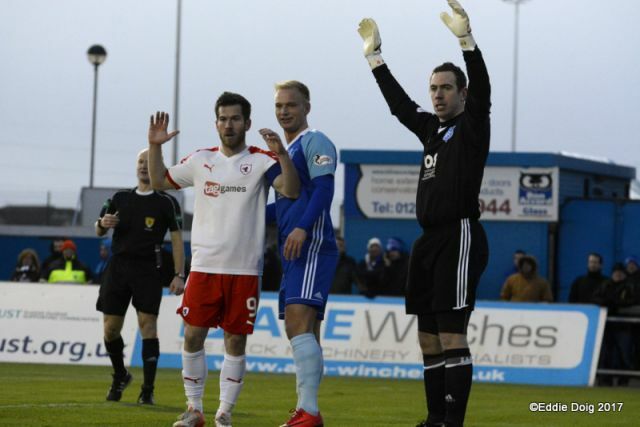 The second rendition of ‘We’re Peterhead’ over the PA is sending the Home fans into a frenzy. The team is led out by captain Liam Buchanan. 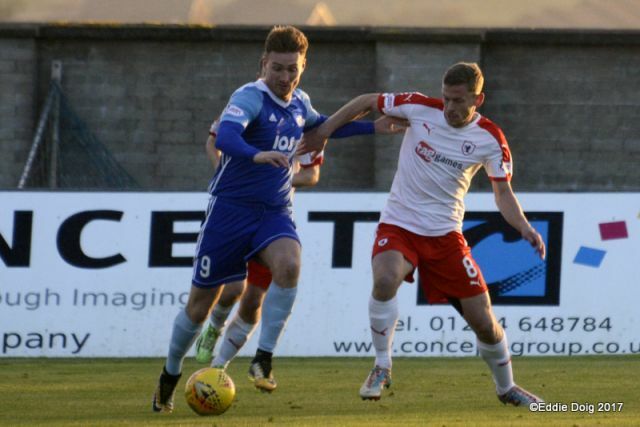 Raith kicking off into the goals at the North terracing. 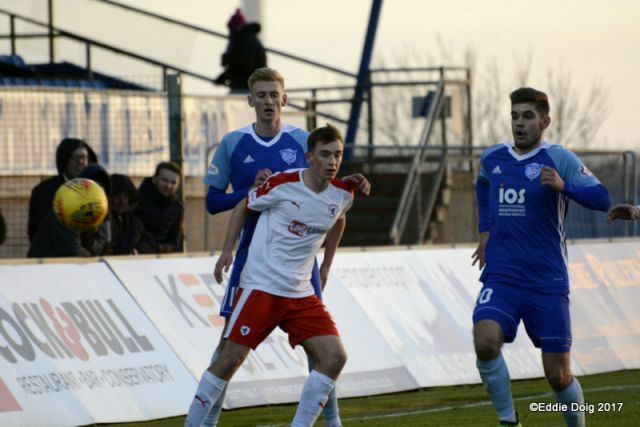 Bright start from Peterhead as they force an early corner. 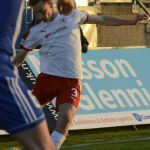 Raith shooting into a strong wind this half. Free kick to Raith deep in own half after a foul on Herron. Not really been much else to report. 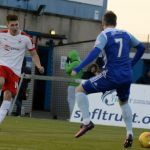 Half chance for Peterhead’s McLean, well over the bar for a goal kick. Home fans think it’s a goal as the ball floats over the bar but lands on the net. 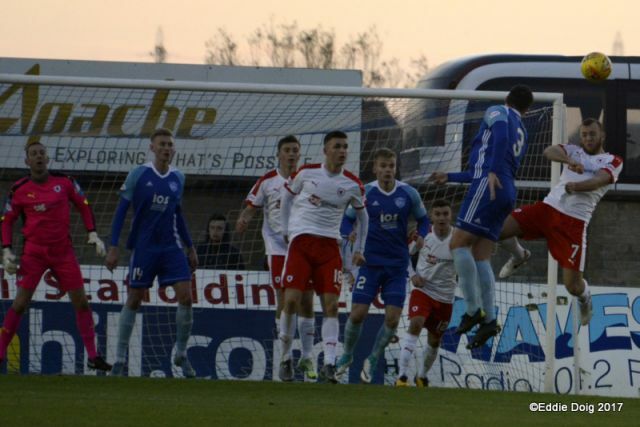 Great clearing header over the bar by Murray gives Peterhead a corner. Nice shot from corner deflected over the bar for a second corner. 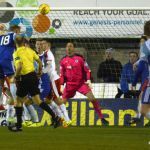 Good save from Smith ends the four-corner attack from Peterhead. 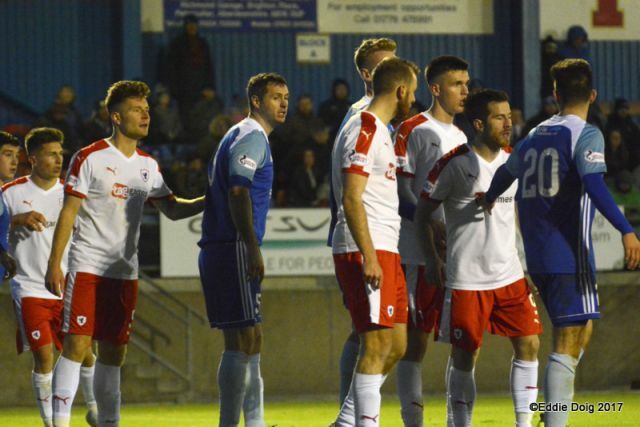 Peterhead players unhappy with a challenge from Court on the halfway line. Free kick. Free kick cleared behind for a corner. 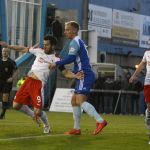 It’s been a good spell for Peterhead. 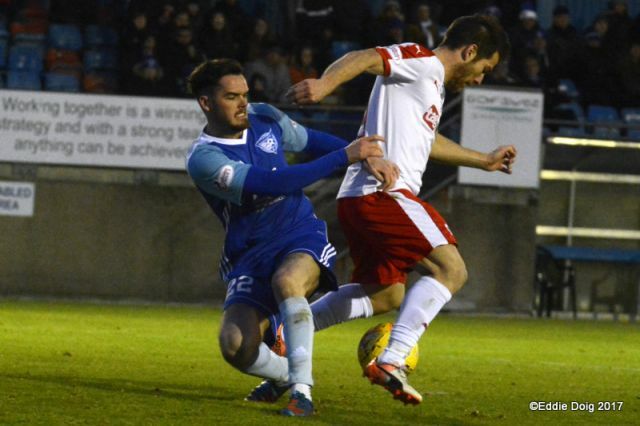 A hobbling Simon Ferry is replaced by 18 Jordan Brown for Peterhead. Dangerous cross from the right wing punched clear by Smith. Robertson does well to clear for another corner. 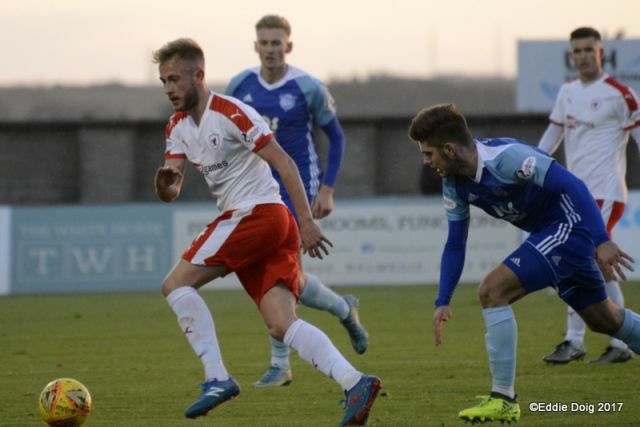 Superb flick from McKay thwarts a great cross from the Peterhead winger. He had to get a touch on the ball there. 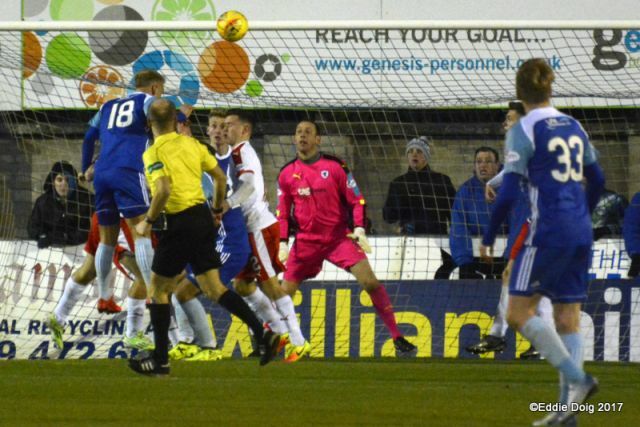 Weak shot from McAllister easily saved by Raith’s Smith. 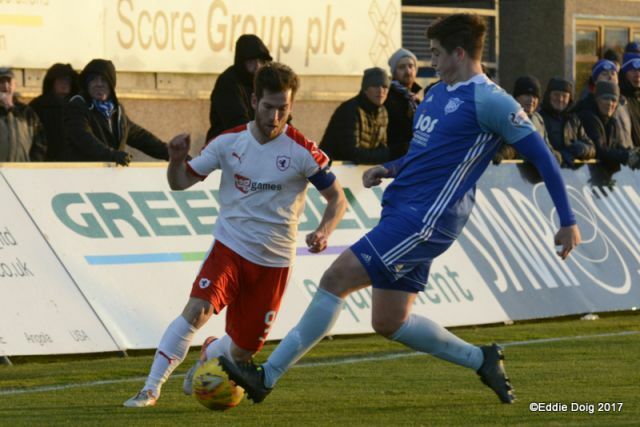 Half time - Peterhead 0-0 Raith Rovers. 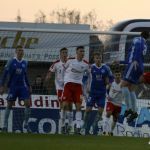 Although Peterhead dominated, they needed to score with the wind. Expecting to see Rovers with a lot more of the ball in the second half. Teams are out for the second half. 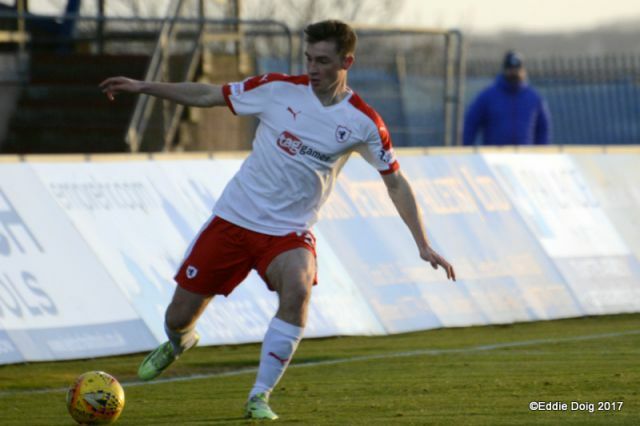 Great chance for Raith. Buchanan turns in the box but deflected away for a corner. 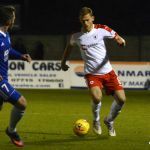 McLean heads wide for Peterhead. Jordan Brown heads home from 6 yards. 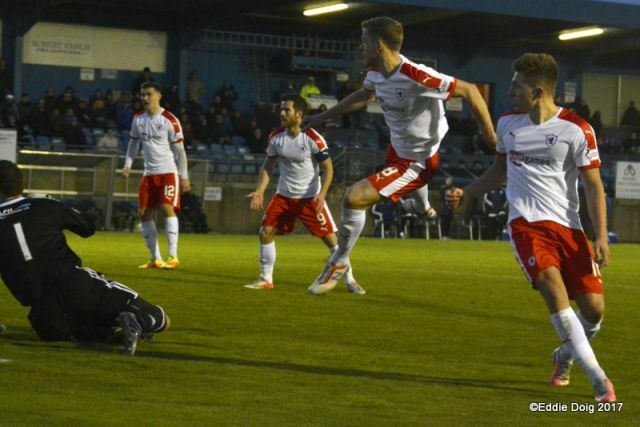 Incredible scenes as McAllister shoots home from inside the box. 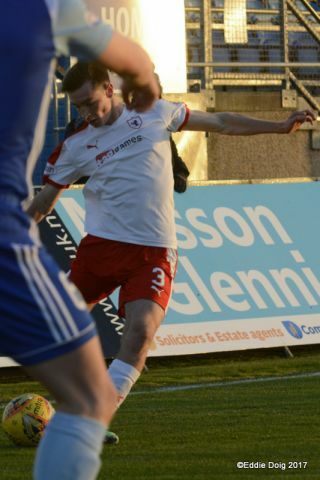 Robertson smashes the ball over the bar from outside of the box. 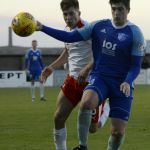 The wind has died down and allowed Peterhead to play some nice football. 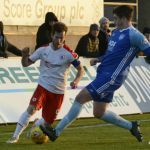 Robertson booked for foul in centre circle. Genuinely very little to report. 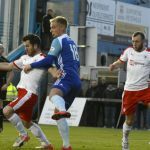 Alan Smith replaces Jamie Stevenson for Peterhead. Tired corner from Herron doesn’t make the box. Cleared away and into the Rovers half. 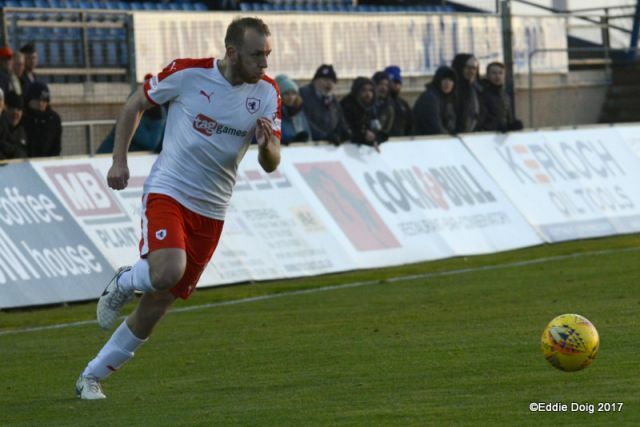 McAllister races away and finishes nicely. 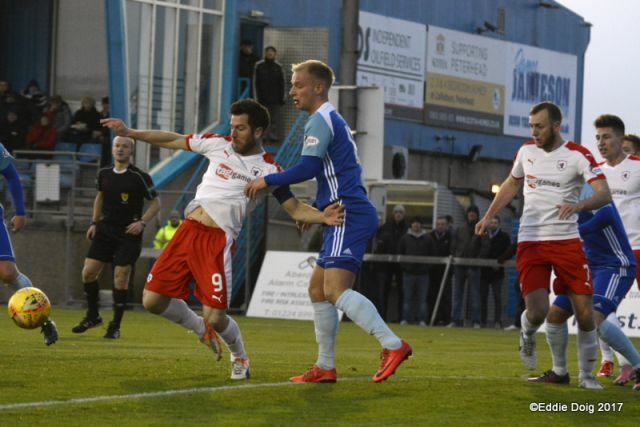 Paul Cairney replaces Rory McAllister for Peterhead. Leitch booked for time wasting. 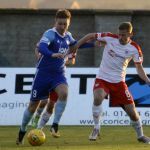 Full time - Peterhead 3-0 Raith Rovers. 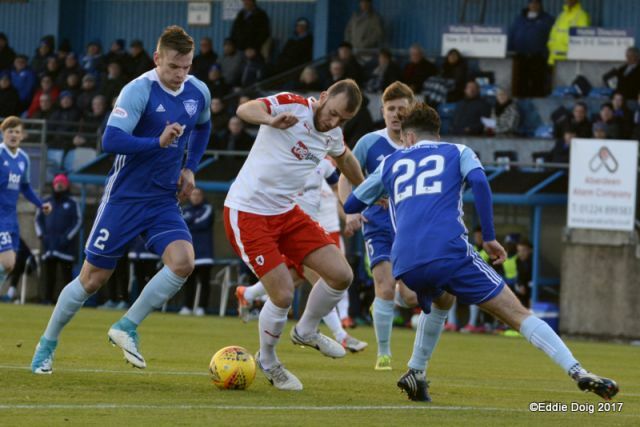 Raith Rovers Scottish Cup campaign kicks off this Saturday, with a trip to Balmoor to take on League Two side Peterhead. 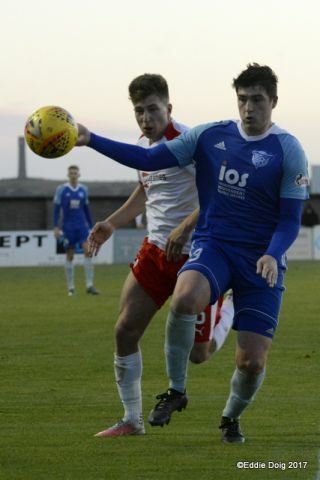 Neither side goes into the match in the finest of fettle, with the Jim McInally’s side going down by three goals to two to Stenhousemuir last time out, while Barry Smith’s team also don’t have their troubles to seek. 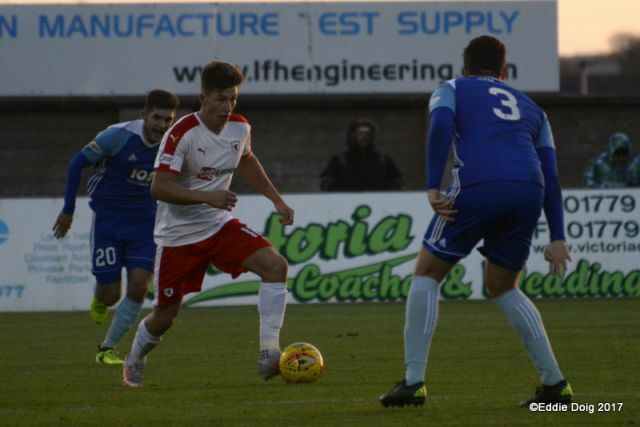 Last weekend’s Irn Bru Cup exit to Dumbarton was followed up with a comprehensive 3-0 loss to Ayr United, meaning Raith are now three points behind the Honest Men in the League One title race. 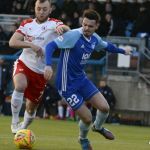 The Blue Toon were the bookies favourite for the basement division before the season kicked off, but they currently find themselves third in the table, four points behind table-toppers Stirling Albion, and one behind Montrose. It’s been nine years since these two sides last met, and it was in the same round of the same competition. 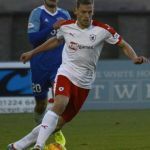 The two were paired together in the third round of the Scottish Cup back in November 2009, and after a 0-0 draw at Stark’s Park, Raith travelled north for the difficult looking replay. 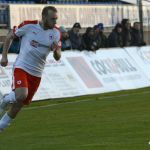 However, goals from Kevin Smith, Stephen Simmons and a brace from Darren Smith saw Rovers safely through by four goals to one. There’s a fairly even split amongst the last ten competitive fixtures between the teams, with Rovers winning four and drawing three.